In July our newsletter is focused on investment banking, one of our primary recruitment sectors, and one which has seen strong growth in the first half of 2014. The Asia-Pac IBD M&A market is being well supported by perfect Investment Banker playing conditions; markets are stable, corporate valuations are increasing and global debt yield is low. This all encourages firms to focus on acquisitive growth. While senior bankers remain cautiously optimistic, the lean times during the GFC seem like a distant memory for many IBD teams across the region. According to Reuters, global investment banking fees totalled $47.1bn USD for the first six months of the year which is the highest level we’ve seen since 2007 and nearly a $5bn increase on the same time last year. This is on the back of a big surge in global M&A deal-flow volume up to $1.75tr USD. Asia-Pacific fees increased by 10%, while fees in Europe surged by 29% so far this year. The Mergers & Acquisitions market in Australia had a strong first half of 2014, with pending & completed M&A deal-flow value reaching $69.5bn USD. If the current trend continues through to calendar year-end this will easily be the busiest M&A year post-GFC. Aussie M&A transactions reached $US52.8 billion by May this year, compared with only $US28.2bn for the same period in 2013. So there was a big ramp up toward the Australian financial year-end. 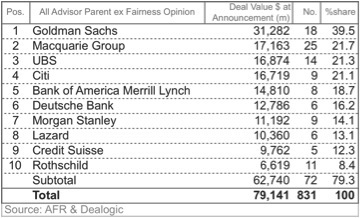 The Australian M&A league table sees Goldman Sachs leading the group, followed by Macquarie Group and UBS. Notably Citigroup is having a great year, with a move to fourth on the Australian M&A league table. Citi were ranked sixth at the same time last year, and nineteeth in 2011, suggesting key strategic hires within their IBD business have resulted in increased M&A revenue over the past three years. The Asia Investment Banking Conference is taking place in Hong Kong on 4th and 5th September 2014. The AIBC is the largest student-organised conference in Asia and covers topics such as M&A, Asset Management, Emerging Markets and Capital Markets. The Financial Times and the Emerging Markets Private Equity Association are hosting the Private Equity in Emerging Markets 2014 leadership summit for private equity investors on 14th October in London.